Wonder Nation Big Men's Short Sleeve Double Pique Polos come in all the school uniform-approved colors that you're looking for. This best in class style is made tagless for comfort, with smart features like a classic two button placket and side vents for added sophistication. Maintain a professional look for longer with Wonder Nation, just remember to machine wash cold and you'll stay looking sharp the entire year. Fabric Care Instructions: MACHINE WASH COLD WITH LIKE COLORS,USE ONLY NON-CHLORINE BLEACH WHEN NEEDED,TUMBLE DRY LOW,COOL IRON AS NEEDED. I order this Wonder Nation Big Men's Short Sleeve Double Pique Polo in the color white for my 12 year old son. When I received it was not the size I expected. I honestly got confused on the size. This size I order is a 2xL (50-52). Yes it's an adult size. My son is 12 years old but hes a husky boy. He is large in the teens or depending on the shirts hes XL. 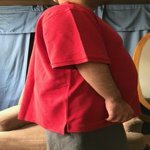 But this size of shirt is more for a Male adult size. 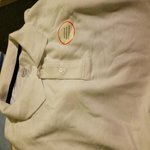 This is a white Wonder Nation Big Men's Short Sleeve Double Pique Polo . I thought it would look like a regular polo shirt but it looks like an school uniform shirt. I believe that's the reason. It has a sticker that say its uniform approved. This polo is made in China 64% cotton and 36% polyester. But this polo is so super soft. Its very stretchy , it's very comfortable. Even though it was to big for my son he loved how soft it was. It fits him perfect. For me a it was big but he loves wearing soft warm clothes. He liked it but I dont like him wearing baggie clothes so to me if fits right for an adult. This white polo short sleeve looks good for a nice formal or casual day at the mall or park. I gave the shirt to my husband for him to used at chruch. My husband doesn't like wearing any type of short sleeve polo shirts. Specially if they come with buttons like this one does. This polo shirt comes with shorts sleeves and 2 buttons and it has a collar. My husband likes to wear does reagular teen looking shirts. But this type of polo shirt make a person look presentable. Which I want for chruch. 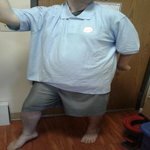 You may also used this shirts for offices jobs or even job interviews jobs. Even though my husband hates this type of polos this one he loves. I honestly think he loves it for the same reason my son does. It's very soft. He now takes it to chruch and even some times to the park. I do recommend this Wonder Nation Big Men's Short Sleeve Double Pique Polo to everyone. It's for nice fancy days or those casual days at the park. Wonder Nation Big Men's Short Sleeve Double Pique Polo Red Size 2 XL - I RATE 5 STARS! 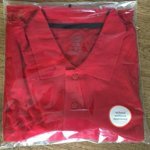 I chose the Red 2XL Wonder Nation Big Men's Short Sleeve Double Pique Polo to review. It is made of 64% Cotton/36% Polyester. It is just one of the many school uniform-approved colors. This classic style is made tag-less for comfort, with awesome features like a classic two button neck and side slits for added sophistication and style. Definitely helps maintain a casual to professional look very easily. 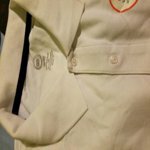 My adult Son was very comfortable wearing this Wonder Nation Big Men's School Uniform Short Sleeve Double Pique Polo. He liked that it was tag-less and no scratchy tag on his neck to irritate him while wearing this comfortable Polo. Dressed up or dressed down he looked great! This best of this attribute is he said is the fit and that you can wear this Polo anywhere. He also likes the easy care of just wash in cold water with like colors, low dry and cool iron as needed. He actually never really cared for any Polo shirts ever before! He has a complete change of mind since trying this Polo and really liking it. Now he wants to buy more Wonder Nation Big Men's Short Sleeve Double Pique Polo colors to wear instead of his usual and I am very happy about that! These are well made with good stitching and no shrinkage or pilling through several washes and minimal color loss. 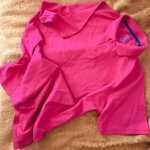 The material is soft and there is no tag to cause discomfort, no binding or twisting in the sleeves and they are a good length. These will last a long time. I am required to wear white polo shirts at work. I always buy from the men's section because as a big girl the men's shirts are more comfortable and less constricting. I have no idea why they think all women want to wear tight clothing some of us want to be comfortable. Anyway, this shirt is so soft, I almost didn't want to wear a t-shirt underneath it. It fit the way I wanted it to, long and slightly baggy because I got it a size larger than I needed. I wear an apron so it doesn't need to be tucked in. It looks good enough to be worn even if I'm not going to work. My daughter wore it to a social function because she needed a long white shirt over her leggings. It cleans up very well. I work around food and it gets stained and dirty every time I wear it. A little stain remover and a regular wash and it looks good as new. Since I wear it to work it gets washed a lot and it has held its shape well. I will have to buy more. I recommend these for work or uniform wear. They are great. Nice Big Men's Short Sleeve Double Pique Polo! 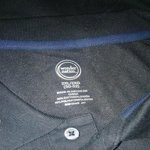 This Wonder Nation Big Men's Short Sleeve Polo Shirt is very comfortable for my husband. It washes great with cold water and I dry it on low heat. It looks sharp and professional with two buttons by the neckline and side vents at the bottom hem. It is 64% cotton and 36% polyester. Overall a very nice well made shirt. Great shirts for the price. Nice material...wash and wear well. They are 'true to size'. I originally ordered 4...once we received them and saw the quality I ordered 5 more. Perfect for school dress code. My Son has worn this shirt to work a few times in the last month since his work place has a dress code. The material is comfortable, soft and on the thick side. It washes well. Dries quickly, but will not shrink even on the highest dryer setting. I was hoping it would shrink since my Son is 5'9 and 195 lbs. With him being on the shorter side, the shirt is a bit long on him. The shirt can also be worn out to a casual outing or goes nicely with a pair of jeans. I personally, and my Son would recommend it to others. The Wonder Nation Big Men's Short Sleeve Double Pique Polo is made of very soft material and feels comfortable. I like that the seam around the inside-collar is reinforced to avoid wearing out too fast and the colour held up well during/after washing. The only thing I would change is make the Polo a bit longer to keep it tucked in better. But overall, the Wonder Nation Big Men's Short Sleeve Double Pique Polo is definitely recommendable. The Wonder Nation Big Men's Short Sleeve Double Pique Polo's come in a large variety of colors. With a great selection of sizes, even large and husky sizes. They are school uniform approved. Made in China at 64% cotton and 36% polyester. They are tag less so no itchy neck. They are recommended to wash in cold water. I found no shrinkage after the first wash. The polo fit nicely to the shoulder comfortably and the sleeves are long and do not hug your arms. 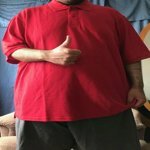 The length of the shirt could be a little longer so when you raise your arms your belly won't show. The polo itself is very soft and comfortable.